Ninja Gaiden has always been about brutal difficulty, skillful combat, a ton of limbs flying in all directions, and a variety of increasingly ridiculous monsters to battle. With Team Ninja under new leadership, its flagship series has undergone a makeover, and the changes may prove controversial to fans. It's different. I'll give it that. Ninja Gaiden 3 wants Ryu to pay for what he's done. His previous outings have seen him mercilessly slaughter enough people to make even the world's most oppressive dictator look like a sleeping hedgehog. The overall theme of the Dragon Ninja's latest adventure is guilt, as well as the difference between a hero and a killer. At least that's what Ninja Gaiden 3 would like you to believe. On paper, it's a noble endeavor to want to add some narrative depth to a series so devoted to casual genocide. In practice, this enterprise amounts to Ryu muttering something about being a murderer once or twice, before being told by some random Japanese man that he isn't. 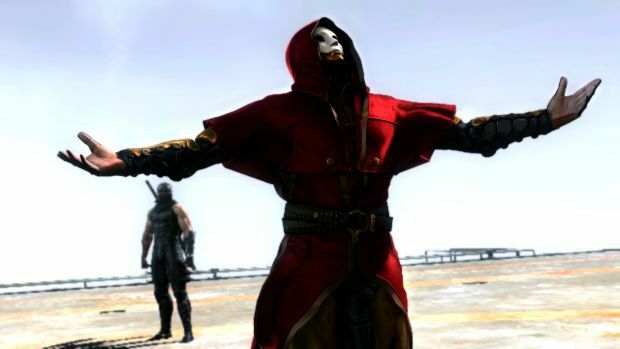 In between, there are plenty of overwrought cutscenes in which Ryu looks slightly upset, and a camp British man in a mask warbles incoherently about how he and the ninja are "the same." For all its attempts to look philosophical, Team Ninja's story has the emotional depth of a damp sponge, which wouldn't be so bad if the action sequences weren't constantly broken up by these desperately cloying moments of exposition. At its heart, the story serves only to justify Ryu's magical red arm, which supposedly contains the souls of the people he's murdered in past missions. What this ostensibly means is that when Ryu kills enough enemies, the arm will glow red and he can instantly kill even more enemies at the touch of a button. It seems quite a shame that for all the talk of Ninja Gaiden 3's thoughtful story, the sole result is that Ryu gets a special attack from a glow-in-the-dark bicep. This reductive approach to Ninja Gaiden 3's themes points to a larger problem overall with the game. While previous titles emphasized difficult battles against even low-level opponents, where blocking, countering, and varied attacks were crucial to victory, Ninja Gaiden 3 has streamlined its combat to the point of becoming a mindless hack-n'-slash game. Ryu's arsenal of exotic melee weapons has been reduced to a single sword (other weapons are coming later as free DLC, for some reason), while attacking simply consists of hammering buttons until everything's dead. Every now and then, players will be required to take out distant enemies with a bow that automatically locks onto targets, but these moments usually serve only to make players vulnerable to attack from short-range foes. Enemies are no longer the threat they once were, and Team Ninja has compensated by throwing a lot more of them at Ryu, to the point where the entire game becomes one long, repetitive brawl. Almost every single stage consists of walking down a linear path, entering a large arena, decimating tons of generic soldiers, and jogging along another path to repeat the process for seven more hours. There's no room for strategic battles anymore, as there are too many enemies on-screen to even see what's going on. I found that the most effective strategy was to hammer buttons until Ryu's health bar started to deplete, then switch to dodging around the room. Combat is too chaotic to really do anything else, especially thanks to a dynamic camera that frequently zooms in and out to try and provide a "cinematic" experience, and regularly allows unseen opponents to land cheap shots from off-screen. There's just no point trying to make sense of it. Merely attack until you receive some clue that Ryu's being hurt, dodge, and start over. That's the key to victory. 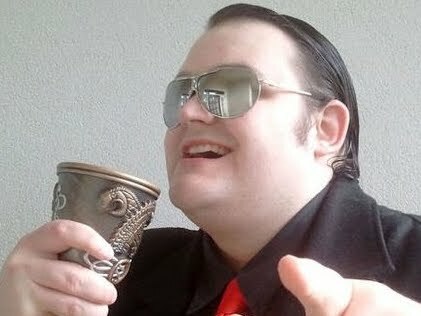 Ultimately, Ninja Gaiden 3 is Dynasty Warriors with more aggressive enemies and sloppier presentation. As a fan of Omega Force's hack-n'-slash series, I don't think the combat is a universally dreadful thing. There is some base gratification to be had in mindlessly slaughtering soldiers before unleashing a vicious special move or magical ninpo attack. Still, I have Dynasty Warriors for such things already, and fans of Ninja Gaiden's more strategic challenge will be left quite unfulfilled by the vapid button mashing on offer. The formulaic level structure and predictable arenas, not to mention lack of weapon variety, make for a game that actually feels less engaging and more tiresome than anything produced by Koei's hack-n'-slash alternative. At least Dynasty Warriors has large maps and a sizable stable of playable characters. 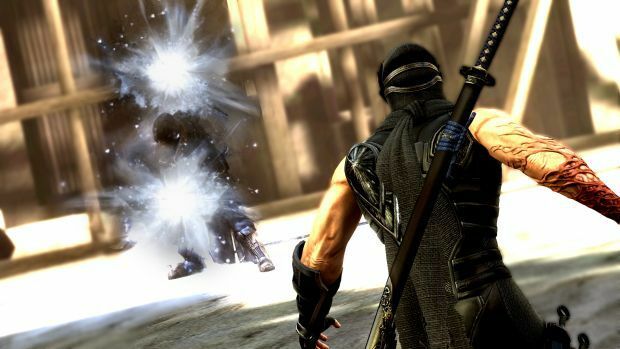 Ninja Gaiden 3 is one ninja, one sword, and an army of pointless mooks. To be fair, the flamboyant violence is quite a spectacle, and the streamlined gameplay is at least solid enough to be worth a few hours' entertainment. Even without the ability to cut off limbs, the brutal sword-slashes and buckets of blood still provide some sadistic amusement, and those moments of calm after a particularly vicious fight are made all the more pleasant by the sounds of the dying, who plead and whimper as they crawl around in the dirt. Every now and then, the pace really slows down as a lone soldier begs for his life, or Ryu's cursed arm completely takes him over. These sequences can prove rather engrossing, if a little irrelevant. The boss fights, while noticeably less challenging than encounters in previous games, are all quite thrilling in their shallow way. Ryu will face off against giant mechanical spiders, genetic monstrosities, and military helicopters during huge, delightfully ridiculous battles. While they all have fairly predictable patterns, each fight usually spans multiple locations and regularly involves some surprisingly effective quick-time events that actually feel engaging rather than alienating. The large battles lack depth, but Team Ninja has certainly done a magnificent job of creating the illusion of a more exciting game, which contributes toward making Ninja Gaiden 3 more fun than it otherwise would be. It's a shame, then, that for all its reliance on visual flair, Ninja Gaiden 3 isn't graphically impressive. The animations are bombastic and rousing, but the colors are washed out, character models lack any sense of diversity, and the textures -- especially in the environments -- are flat and featureless. The drab visuals make combat even more irritating, as it becomes far too easy to lose Ryu within the murky sea of enemies. There's also a rather bizarre bug that sees the game attempting to autosave to the hard-drive at moments when it's not supposed to (especially when saving is manually done at checkpoints). Rather than save anything, the entire thing just freezes and the console will need to be restarted. It happened only twice during my play-through, but more than once is an indication that there's an actual problem there. 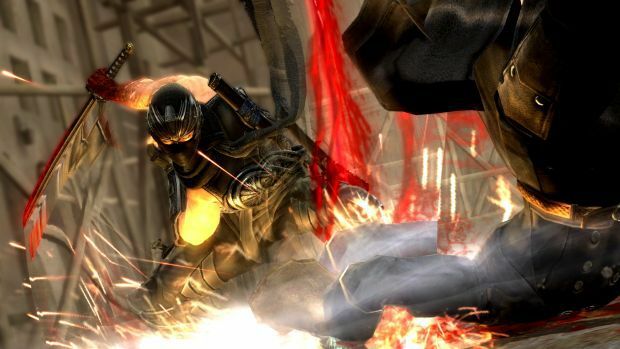 Team Ninja dabbles in Ninja Gaiden 3 with a new online component, Shadow of the World. 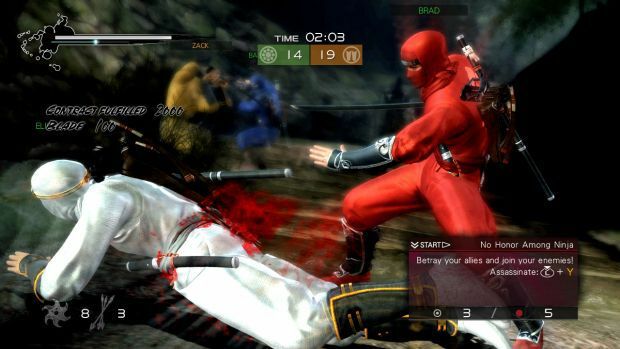 In this mode, players take control of their own ninja, completing co-op or competitive games to level up, earn new costume pieces, and strengthen their prowess. While this could have provided some of the meatier content missing from the campaign, it really doesn't. The co-op offering is just a set of arena battles copied from the solo mode, the only difference being "contracts" that demand certain enemies be defeated with certain attacks. The addition of a second player only makes the whole thing quicker -- there's no real "cooperation" to speak of. It's just two players temporarily sharing the same space. Versus mode brings four-on-four battles to the table, and they're about as messy as you'd expect. Each match seems to consist of players sliding around the arenas, hitting buttons and hoping they hit something. It's the same combat seen in the rest of the game, absolutely not designed for multiplayer purposes and fit only for confusing and frustrating the players who inflict it upon themselves. 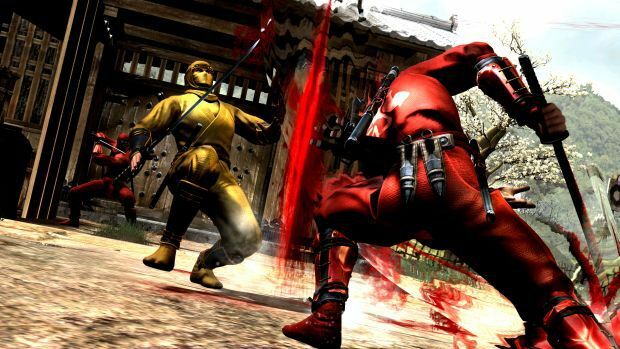 Gameplay wasn't altered at all to account for the human element, and with the game's imprecise targeting locks causing people to hit thin air more than enemies, the whole thing looks like an elaborate costumed dance as opposed to brutal ninja-on-ninja warfare. Character customization is fairly weak, boasting a meager handful of physical elements to tweak, like a game from five or six years ago. The leveling system is as straightforward as could possibly be, with costume pieces and expanded special moves tossed in at intermittent stages of progress. The character building seems to exist solely to obtain the most amount of replay "value" with the least amount of effort involved. All told, NG3's multiplayer mode is the very definition of a lazy online component, tacked on simply for the sake of existing. 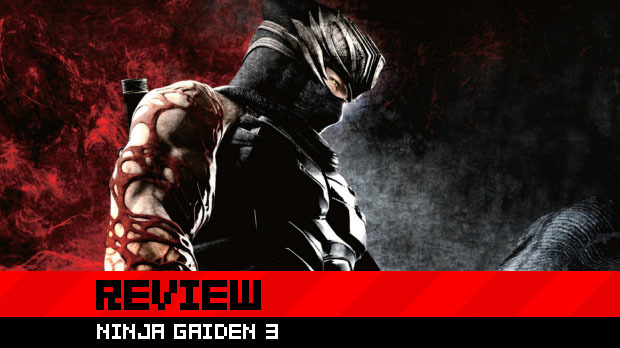 Ninja Gaiden 3 isn't wholly terrible, but it is a significant step down from previous titles, removing many elements that made the series stand out from the crowd and adding features we've seen in dozens of previous action titles. Ironically, Team Ninja's attempts to revamp the series and do new things have only led to it feeling more stale and mundane than ever before. Sporadically entertaining, yes, and seasoned with shallow-yet-satisfying moments of carnage, but ultimately nonessential and forgettable. Players desperate for traditional action gaming may glean some passing repletion from what is ultimately an inoffensive waste of time. However, the monotonous action long outstays its welcome and a series of this pedigree should be bringing so much more to the table. Instead, it does just enough to be a videogame available for purchase, and not a lot more than that.